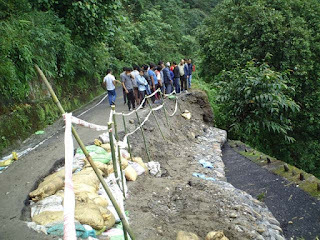 Executive engineers of the Gorkhaland Territorial Administration today said repair work on the 50-metre stretch of road in Rohini that sank several feet on July 24 was being hampered by incessant rainfall the region continues to face and it would take a fortnight before vehicular movement could be allowed. The 50-metre stretch at Sirubari, 7km from Kurseong town, one of the alternative routes that connects the hills with the plains, was damaged after it sunk nearly 5-6 feet. Repair work on the damaged portion started from the very next day and traffic was diverted to the Pankhabari and Mirik routes. Smaller and light vehicles were directed to take the Pankhabari road, while heavy vehicles, carrying food and other essential commodities, were asked to ply via Mirik. GTA engineers had then said the Rohini road would be opened to traffic after 4-5 days, but continuous rainfall has hampered repair work forcing to reschedule the opening. “Repair work on the damaged stretch of road at Sirubari is in progress and we are working overtime, even durig night. However, incessant rainfall is playing spoilsport. We are working in the night, but this involves risk to life,” said K.C. Ghimirey, the GTA executive engineer. Besides Rohini, the hills are connected by National Highway 55, and the Pankhabari and Mirik roads. One can also take NH-10 (connecting Sikkim) via Sevoke in Siliguri to reach the hills. But the Rohini road has had to bear the load of heavy vehicular movement because NH-55 continues to remain closed even aftre more than four years. In 2010 and again in 2011, major landslides damaged stretches of NH-55 at Paglajhora, Ghayabari and Tindharay. The highway was reopened in 2014 but further landslides caused extensive damage to the road and tracks of the Darjeeling Himalayan Railway. The DHR track has been repaired from the Siliguri side up to Rongtong in Kurseong, while services from Darjeeling are also operational. But the 87km direct ride from NJP to Darjeeling remains closed. “We cannot say how long it will take for the repair work to get completed as everything depends on the rain. We will be able to get a clear picture in a couple of days, but as of now it may take at least two weeks to fully complete the repair work,” Ghimerey said.